I have no idea how Joe Biden is going to get home tonight. Apparently, the train tracks at BWI are flooded, which has suspended train service between DC and points north. 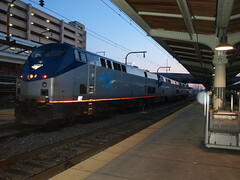 Amtrak is reporting a water main break near the tracks at BWI which has rendered the area impassable. It’s likely there won’t be a fix until this afternoon at the very earliest, from what we’re hearing on Twitter. The MARC Penn line is also affected. Correct me if I’m wrong, but doesn’t Biden live in DC now? Near the Naval Observatory? Um, he will probably walk from his office to his house, which are both at the observatory. Apparently I had a massive Humor FAIL this morning.